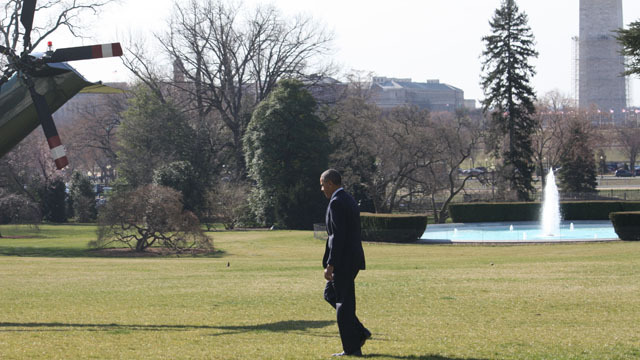 President Obama leaves the White House Friday to speak in Chicago about his energy proposals. Washington (CNN) - With climate change as one of his administration's top priorities and the decision on the controversial Keystone pipeline expected at any time, President Obama takes his energy message to Chicago Friday. The president is expected to press Congress to pass an energy proposal that the administration says would target two billion dollars over ten years to wean cars and trucks from fossil fuels to clean energy and create clean energy jobs. The president announced his Energy Security Trust plan at his State of the Union address last month. Friday Mr. Obama will lay out details of the plan as he speaks at the Argonne National Labs outside Chicago. White House officials told reporters on a conference call Thursday, the money to fund the alternative fuel research will come from increased royalties from oil and gas drilling and leasing on federal land. The White House officials were quick to point out the administration does not plan to expand drilling areas especially on the Outer Continental Shelf but instead expect increased revenues due to streamlined leasing, increased production and upward price trends. The Energy Security Trust would require an act of Congress but White House officials said they are encouraged by early bipartisan support. The White House says this is just the latest in the president's "all above" energy approach. The Environmental Protection Agency Friday is expected to release a new report which the administration says underscores the progress made on the clean energy front including EPA estimates that CO2 emissions have decreased by 13% in the past five years and that fuel economy standards have increased by 16%. "the money to fund the alternative fuel research will come from increased royalties from oil and gas drilling and leasing on federal land." Translate this into higher gas prices to cover the royalty increased royalty payments to the government. Does Obama even have a successful story to tell on "Green" energy programs? Volt was a bust, Solondra, etc. Europe has been paying around $10 a gallon for gas for DECADES! You are spoiled, a rotten child! Gas prices will continue to go up. And up. And up. Because it isn't an infinite source. The methods now employed to get at the last few drops are quite expensive, and the money would be better spent finding alternatives that are less destructive. Since you seem so thrilled about Europe why don't you move there? Let me guess. You are one of those "all inclusive" libs? I assume you ride a bike or drive a Prius, cut and burn your own wood at home and have your own personal generator with solar panels on the roof? Maybe you should leave and move to Europe then. Rumor has it that the new green fuel for cars is compressed Unicorn dung. We have more accessible oil than Saudi Arabia. ND has a <3% unemployment rate. Clean fuel funding equals infusion of cash to Obama supports. Why should we pay 10/gal for fuel when we have over 500 years of fuel waiting to be harvested? Your logic is dizzying? Europe (Cypress) just confiscated 10% of everyone's savings account and gave it to a central bank. Germany has stated that they will take a couples children if they continue to home school, Greece is down the toilet, France can't say no to the extremist Muslims and now is paying the price, Italy is just Italy; who wants to be them! Please, go find JULIA from the Obama campaign and live out your life totally dependent on the Government for everything you get, and if you get really fed up with all this talk of lowering gas prices and defunding the money laundering scheme known as "CLEAN ENERGY", please take it to Cypress where I'm sure you'll find some sympathetic minds there... at least for a few more weeks.. I love it when a liberal wets themselves. What Europr doesn't have is vast reserves of natural gas which could potentially power the US for hundreds of years. There was enough natural gas in storage in early 80's when I was employed in natural gas industry to power our country for over 300 years. Additionally, I guess you haven't done much research on Balkin Oil Fields in North Dakota which alone are estimated to have more oil than all of the middle eastern countries combined and that isn't even considering oil reserves just found in Colorado. In short, this is a subject which you just have no knowledge and it's dangrous to get information from MSNBC(LSD). @shearra,isn't it funny when you state something intelligent the republicans want to rain on your parade but have nothing themselves to inject intelligently, much as their illiterate reps do in not helping America..They just like blocking the parade so to speak don't they!! Switching from wagons to cars, from steam to internal combustion, etc. took decades with experiments all over the world to make it work, but they were world-changing. Our dependence on fossil fuels is the same, Studebaker switched from Wagons to cars and was successful for 50 years, Thomas Edison lit the world in a new way after worldwide experiments. They didn't say, "Well, I tried, so I'm quitting." That seems to be your philosophy, unless you are a CPAC- type Republican and that would explain it. .No science, no environmental protection, no global warming, no evolution, no minority voting, no women's rights, just plain "no" to everything. I'm proud of those that have said "No" to your Messiah and Chief. We are 5 trillion less in debt because of them. You seem to be confusing the government and private sectors in much of your post and the rest of it seems to be lies taken directly from Dem talking points. Following are some of what the repubs say need to be eliminated i.e. things they want to say "no" about. You (Dan5404) can tell us the ones you want to say "yes" to – ok? These are in Ryans proposed budget listed as things that can be cut. He listed about 100 more line items just like the ones I listed below. $445 million a year for PBS Subsidy. $25 million a year to "Save Americas Treasures Program. $17 million annually for International Fund For Ireland. $420 million for Legal Services Corporation. $167.5 million for National Foundation for the Arts. $1.65 billion for Amtrack Subsidies. $1.3 billion in duplicate Education Programs. $15 billion for Fed Travel Budget. $1.5 billion for National and Community Services Act. $1.39 billion for International Deelopment. $775 million for Presidential Campaign Fund. $1 billion in unpaid taxes by Fed Employees. Are you suggesting that if Oil drillers payed nothing to remove oil from leased land then the price would drop at the pump? Your naive if you think that's the way it works. Another photo op for the lamest president since Jimmy Carter...at least carter had some background as a peanut farmer! This empty suit is just pathetic...and he doesn't care about the middle class. Our taxes "won't increase 1 dime"...yeah right! Liar in Chief! they already have more than that, and OblameOcare is still not fully implemented! What a loser! So the President is taking another unnecessary trip at the tax payers expense. The first lady has shown that technology is in place for one to virtually give a search almost anywhere yet remain in the White House. We want to see the bottom lien here. The President's goal is for the federal government to start posting surpluses by 2015 but even the President's own White House is predicting that at best the President;s goal will not be achieved and the federal government will continue to post huge deficits for at least another decade. The Presidenneedsds to provide a detailed financiaplanln as to how his goal can be achieved. Obama's all of the above approach... Solyndra and windmills. And natural gas has only increased because of expansion on private lands, especially North Dakota. Unless you can get more out of these technologys than what you put in they'll never be cost effective. Research is fine but we shouldn't be funding these companies from scratch to start up. We've seen multiple failures already and keep throwing good money after bad. Obama is like a kid with a new checking account – I have to have money – I still have checks left. I see obama is killing the eastern europe missile defense system to appease Russia while all the headlines say we are bolstering our defenses agains North Korea(they are NO threat)... bo's promise to the Russian in the open mic affair is being kept. The America people are being sold out by the marxist president...suckers! Why not put a tariff of a few bucks on the shale oil that is so plentiful here and rather cheep compared to oil on the open market and use that tariff money to fund clean energy projects? But the current administration would rather just throw money at clean green energy without a funding source. Using a tariff would provide much more money from a source that is rather plentiful here in the good old USA. Then maybe one day we can sell the Arabs fresh great lakes water at 100.00 barrel as pay back. So how do we dispose of batteries when they are spent? Last I heard Batteries are certainly rather difficult to dispose of safely. So why are we not running natural gas in out trucks busses, and trains, natural gas is a rather clean form of fossil fuel and it is rather plentiful? Oh wait I know the current administration does not like to propose solutions that make sense and are relatively cost efficient, they would rather take the most expensive prohibitive impossible way? There isn't anything the President can do about climate change. The IPCC models have been wrong because they have failed to take into consideration the negative feedback effects of H2O in the upper atmosphere. For the earth to warm up because of green house gasses the upper atmosphere has to cool so that the earth outputs less energy. Any upper atmospheric cooling decreasde water vapor content in the upper atmosphere creating a negative feedback. Wator vapor is the primary green house gas. As water vapor in the upper atmosphere decreases the upper atmospere warms up radiating more energy out to space and the earth cools back down again. Negative feedback systems such as this one are inharently stable. There are many reasons to conserve on fossil fuels but climate change is not one of them. Don't forget the 12 Billion $$ hi speed train boondoggle that he has been hiding for the past 4 years. And even after been called out, he still wants more billions. @uncdig,check out republican governor Rick Scott of Florida shooting down a potential multi billion dollar high speed rail system saying it wouldn't create jobs but he hasn't created any since he blew that deal off did he! !Real republican progress from where I don't know,not in this country it seems!! Why didn't Obama just say "I'm going to flush more money down the toilet since I've had so many successes". there is a lot of clean energy popping up everywhere solar panel fields big windmill fields houses and big buildings with solar panels on them everywhere, but the energy companies keep gouging the American people going up in price why? If you mean oil/natural gas then it has to do with the extreme uncertainty in the Middle East in addition to this administrations energy policy. Obama needs to take a lesson from losing every county in West Virginia (first time this has happened in more than 100 years)- a war on coal is not good. That being said, alternative energy is fine. I pay extra to get energy from windmills. If it works why not? Shale gas is the key to energy independence in the short term. The President is determined to achieve that goal. Green energy is the key to energy independence in the long term. The President is determined to achieve that goal. The best scientific minds in the nation tell us that global warming is real and that our expulsion of greenhouse gasses is a significant contributor to warming. The president is determined to reduce automobile exhaust emissions and lower the deman for fossil fuels. Its easy to point fingers and make snide comments but as usual those who do don't know squat about squat. Keep tap dancing on the land mines with the environment but heh no one lives forever not even you kids or grandkids. Keep on thinking that petroleum is your friend and as far as what kind of car I drive is concerned I'm sure that is not an issue. the only policy o'fool has is to destroy America one way or the other. Climate change correlates with solar activity and not to CO2 levels. The President's proposal does not do anything to change the sun's activity, our orbit around the sun , nor the sun's orbital path through the galaxy so it does nothing to affect climate change. If you believe in the green house gas theory of climate change then the real culprit must be water vapor and the President's plan does nothing to control that. Where are the jobs for the 14 million still out of work??? Where is your jobs program??? Where is the comprehensive energy policy??? Please, please, don't tell me you're as tied to the green energy business sector as some others are to the oil business sector!!!! You attack the oil industry, and you attack jobs. Green energy is good. Now, how are you going to make up for lost jobs?? No more coal - too damaging for our environment and our health in a number of different ways. What if i said that if you take out all the additives and go back to raw gas you could get up to to 150+ mile per gallon! What if i said that people could own their own electric power and but it like a washing machine that could power a home on two 12 volt car batteries! this is all true all you need is the knowledge! Biofuel is cheap, not! The Senate Budget had the US Navy buying 450,000 gallons of biofuel form an FOB (Friend of Obama) at $26.00 a gallon. Maybe the liberals should have to buy fuel at that price too? North Dakota is helping by drilling on private lands and they are also helping in providing jobs. Now if only Obama were to follow the lead of something that works. @Al,he's created a hell of lot more than that idiot in Bush.The only jobs booming while he was in office were the companies making caskets,body bags ,military uniforms for our vets and that's plenty! !O yah he hired hundreds of thousands Bush did in the government sector in jobs so his unemployement rates were kept artificially low and now after 600,000 laid off by Pres.Obamas trimming unless waste you start to see government about the right size again!! Alternative fuel research is money well spent IMO.